Finally we have published in Applied Soft Computer journal the last paper related with my thesis. We used OSGiLiath to perform a number of cool experiments related with automatic adaptation of dEAs on heterogeneous clusters. Distributed Evolutionary Algorithms are traditionally executed on homogeneous dedicated clusters, despite most scientists have access mainly to networks of heterogeneous nodes (for example, desktop PCs in a lab). Fitting this kind of algorithms to these environments, so that they can take advantage of their heterogeneity to save running time, is still an open problem. The different computational power of the nodes affects the performance of the algorithm, and tuning or fitting it to each node properly could reduce execution time. This paper proposes a methodology to design and implement Evolutionary Algorithms using the Service Oriented Architecture paradigm. This paradigm allows to deal with some of the shortcomings in the Evolutionary Algorithms area, facilitating the development, integration, standardization of services that conform a evolutionary algorithm, and, besides, the dynamic alteration of those elements in runtime. A four-step methodology to design services for Evolutionary Algorithms is presented: identification, specification, implementation and deployment. Also, as an example of application of this methodology, an adaptive algorithm is developed. You can download the paper draft from the publications section or directly here. The electronic version by Springer is also available. I am happy to announce that I’ve read my PhD dissertation Service Oriented Architecture for Adaptive Evolutionary Algorithms: Implementation and Applications. If you are following this blog (and my twitter) probably you have followed a lot of steps of its development. So… I am a Doctor. Finally. Now, where is my secret underwater base??? The objective of this thesis is to prove that the Service Oriented Architecture (SOA) paradigm can be used to create distributed, heterogeneous, dynamic and standards-based environments for Evolutionary Algorithms (EAs). SOA provides independence in programming language and transmission mechanisms, and also facilitates dynamic component management. A methodology to develop EAs in these environments is proposed. In this methodology, called SOA-EA, the SOA paradigm is proposed to develop Service Oriented Evolutionary Algorithms (SOEAs). The proposed methodology takes into account the requirement to develop services and EAs, and it provides the steps to identify, specify, implement and deploy the elements that conform a SOEA, and how to convert a traditional EA into a SOEA. To validate this methodology, it has been used to create a framework for SOEAs, called OSGiLiath, based in a public specification technology (OSGi). This framework provides mechanisms for dynamic component management and language and transmission independence. OSGiLiath and SOA-EA have been used to carry out experiments in different areas to validate dynamic control and different and heterogeneous environments: decentralized distributed EAs, other systems integration and different EA models. This thesis have been developed using the Open Science movement. All the .tex files have been publicly available in this Github repository since the first day using Free Licenses (as the source code of OSGiLiath), but you can download the compiled PDF of the thesis here. As a quote I’ve read somewhere (probably in PhD comics) “The thesis is not the end of the way. It is the way itself“. Yes, I agree. In part. The way is not over yet. Thank you to all that have made this possible. This work presents the results obtained from comparing different tree depths in a Genetic Programming Algorithm to create agents that play the Planet Wars game. Three different maximum levels of the tree have been used (3, 7 and Unlimited) and two bots available in the literature, based on human expertise, and optimized by a Genetic Algorithm have been used for training and comparison. Results show that in average, the bots obtained using our method equal or outperform the previous ones, being the maximum depth of the tree a relevant parameter for the algorithm. You can download the paper draft from here or from the Publications section. Next 30th April the OSLUGR will host the final of the CUSL7 in the ETSIIT. OSGiLiath Evolutionary Framework, with the other awesome projects, will be present, of course. More information is available in this webpage. Join us! 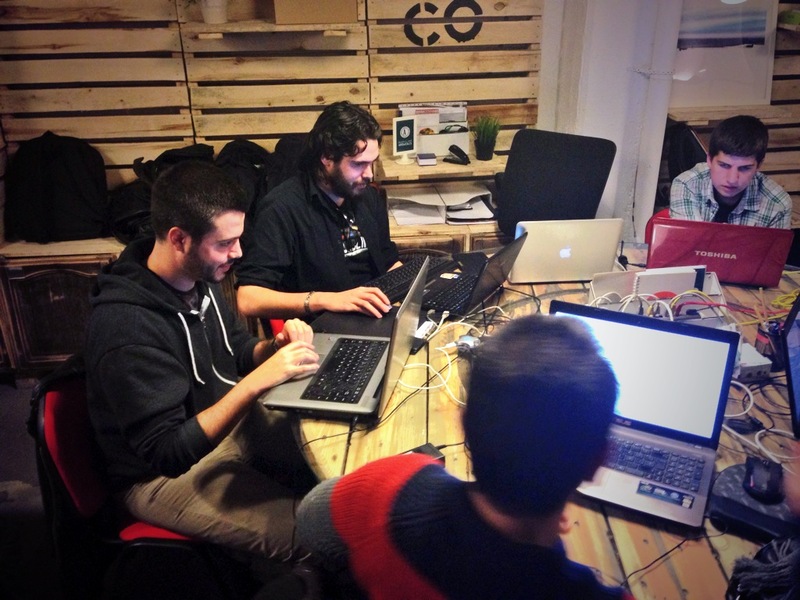 This weekend the Free Software Office of the University of Granada has organized the 6th Hackathon for the University Free Software Contest (CUSL). During the weekend OsgiLiath has been improved thanks to the help of @antaress @jmkaos and @silus_27, and with the opinions of @makova65 and @renatorrl. New matching function, with penalization using euclidean distance with the background to allow more distribution of the primitives around the image. Modification of mutation function to mutate different elements, not all at the same time. New parameters and integration of several methods. Thanks to all participants and organizators! #6Hackathon of #cusl8 is coming! Next Friday 14th OSGILiath will participate in the #6Hackathon organized by Free Software Office of the University of Granada (OSLUGR), inside the VIII Free Software University Contest . As in previous edition, several students will collaborate improving OSGiLiath and other cool projects. As other students did last year, you can contribute to OSGiLiath developing operators for generative art or maybe to model AI bots to be used in videogames. See the results in this presentation, we even published a conference paper! More information and inscription form at the OSLUGR webpage. Service Oriented Architecture for Evolutionary Algorithms, developed by Pablo García-Sánchez at University of Granada, Spain. OSGiLiath: Service Oriented Architecture for Evolutionary Algorithms by Pablo García Sánchez is licensed under a Creative Commons Attribution 4.0 International License.